When you’re working on setting your website up with good, local SEO it’s important to use the right tools and know how to use these tools properly. One of the best tools you can have in your arsenal today is Google My Business. This is a free tool that’s easy for you to use in managing your online presence in Google. It’s also the first thing people will see when searching for your business in Google – displayed first on mobile and in the top right on desktops. The point is customers can learn a lot about your business so they can decide whether they want to visit it. You’re more visible in searches which will also help your local SEO (what attracts people in your neighborhood). It helps your customers have a better experience because they understand who you are, what you do, where you’re located, and where to find your website. It brings you more traffic because the more Google knows about your business, the more searches it’ll appear in. Make sure your business information (NAP: name, address, phone number) is completed and contains up to a 750-character description. This should match what your website says as it’ll help improve your Google ranking. Uploading lots of great images will improve your click through ratio by 35%. Include images of the inside of your store and up-close photos of what you’re selling. Of course, having an up-close exterior photo and pictures of your employees will help too. You don’t want to be the only one uploading these photos though – make sure your customers add some too. It’s important to moderate these, removing any that aren’t relevant, are of poor quality, or are otherwise offensive. Uploading videos will also help attract customers. 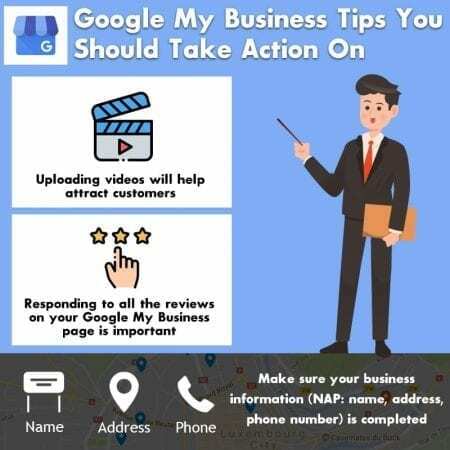 Since video marketing should already be a part of your business today, you should also be adding these videos to your Google My Business page. Since this was just introduced in January 2018, many businesses aren’t using it yet, which means you can get a huge advancement over your competition here. Responding to all the reviews on your Google My Business page is important because 85% of your consumers put a lot of trust into these reviews. About 30% of people also judge a business by how it responds to their reviews. It’s only natural for us to want to learn from others’ experiences. Use Google Posts to help you promote your events, company news, offers, promotions, and content. Since 70% of people look at various businesses before making a final decision, this is your opportunity to make your business stand out. Keeping up with Google My Business is important for your local SEO, but as a business owner your plate is probably already quite full. Instead of overlooking this powerful information, enlist some help from the Local SEO Tampa Company. Over the years they’ve helped many business owners strengthen their SEO. Yours should be next!